Today the Eurostat updated its quarterly measurement of employment in the Eurozone. 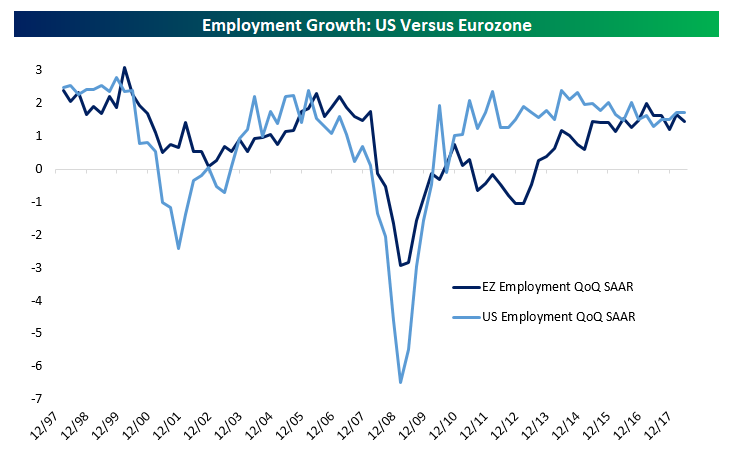 As shown in the chart below, Eurozone payrolls expanded less than the US for three quarters running, after three quarters of Eurozone employment outstripping the US. Both economies are growing employment at a pretty similar and strong pace, in the mid-1% annualized range. Most of the current global cycle has seen the US grow employment faster than the Eurozone, but of course the US saw employment contract faster than the Eurozone during the global financial crisis. 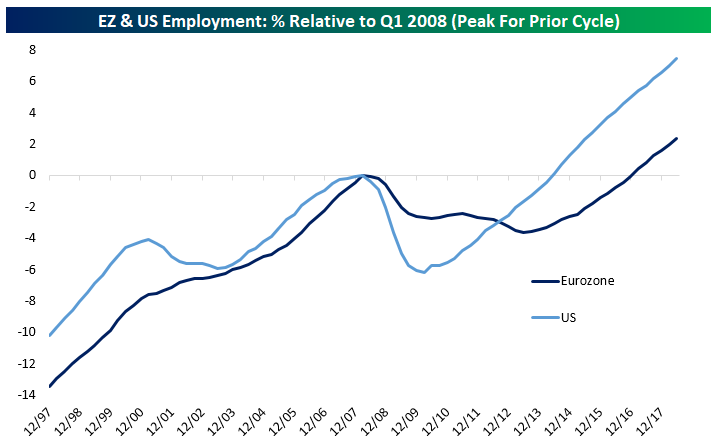 Since the first quarter of 2008, when both Eurozone and US employment peaked (chart below), there have been multiple large swings in employment in the world’s two largest economies. In the US, employment dropped 6.2% from the pre-crisis peak through Q1 of 2010. The Eurozone drop (-3.6% from peak) was much less dramatic, but it took further to get there (Q2 2013 bottom). Since bottoming, US payrolls have surged 7.5% relative to their Q1 2008 peak, while Eurozone payrolls have advanced 2.4% versus the prior peak.